Charing Cross Road. 123 Charing Cross Road, to be precise. It’s an address that evokes a romantic, bookish notion of London. It’s also the London of theatreland, of international students with matching rucksacks and of ‘arty’ bookshops with pulsing neon signs and pulsating basements. 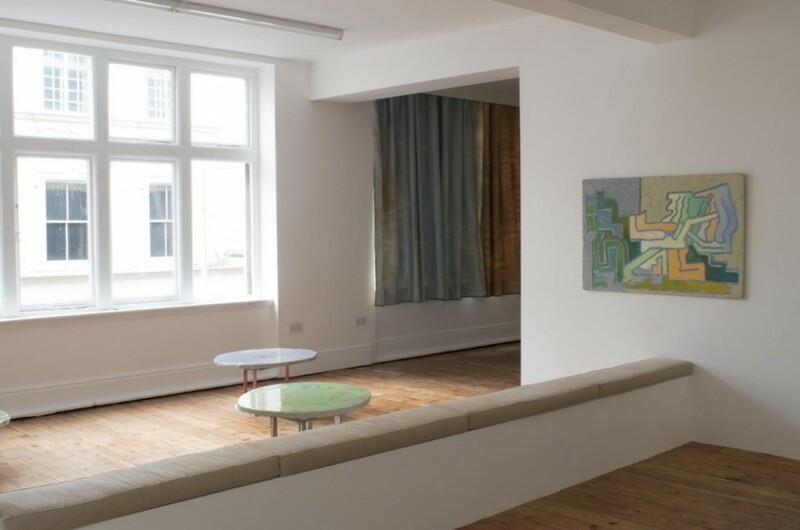 Recently, it hasn’t been much of a contemporary art destination, but that looks set to change since it is now the new London home of one of Istanbul’s most dynamic contemporary art galleries: Rodeo. 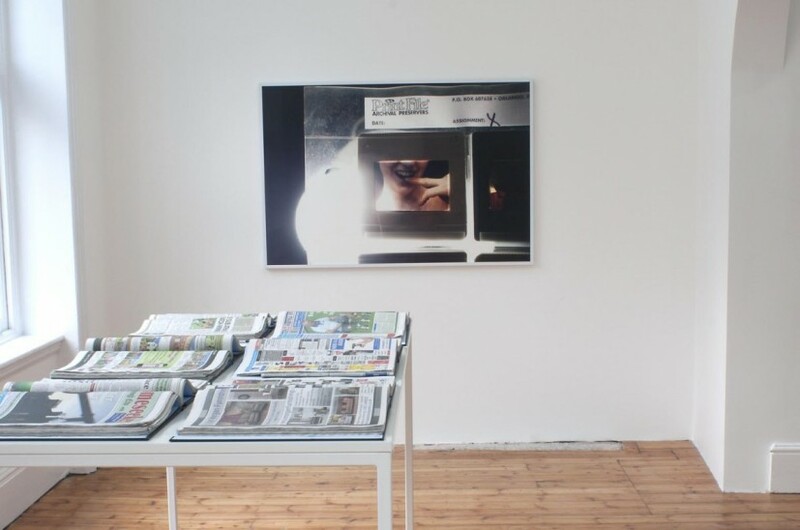 The gallery represents an international roster of artists including two of this year’s Turner Prize nominees: Duncan Campbell and James Richards. Rodeo’s London outpost occupies two floors above one of the aforementioned bookshops. It’s a space with character: old floorboards, a collection of mismatched skirting boards and a winding staircase that takes you from the first gallery, in which Canadian artist Tamara Henderson’s work is installed up to the second, which features Turkish artist Banu Cennetoglu’s exhibition Gentle Madness. 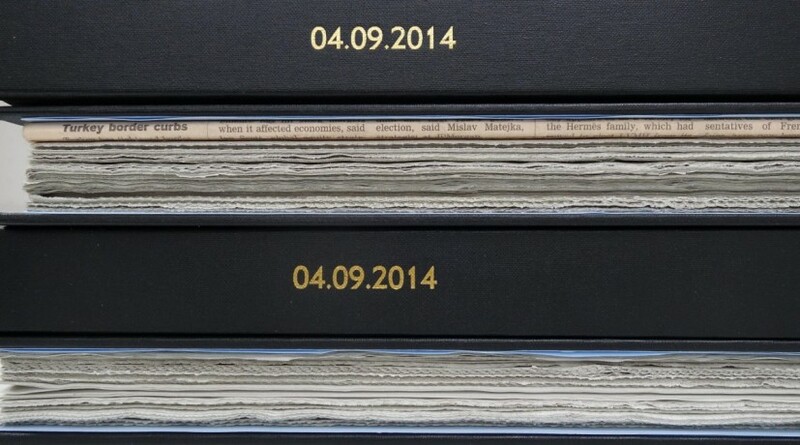 The central work in this show is 04.09.2014 (2014), a monumental archive of all the newspapers issued on a single day across the UK and Channel Islands. Gathering together all the news published on one day in a designated territory is a task Cennetoglu has already undertaken in several countries: Turkey, Switzerland, Cyprus and 19 Arabic-speaking countries. 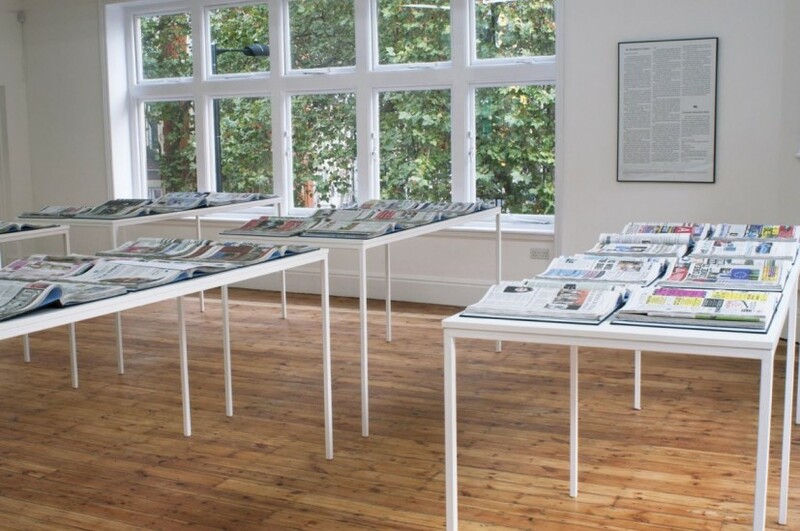 In her show at Rodeo, the newspapers are bound into 46 separate volumes, laid out on tables for visitors to look through and begin to attempt to get a grasp of what is and isn’t featured in newspapers from different places, and targeted at a wide range of communities. The sheer quantity of newspapers along with the information they contain is dizzying. It’s fun at first to leaf through and look at how different places do news, but once the novelty of being invited to touch and read an artwork passes, the power of the work – the way it materialises an almost infinite range of different points of view and areas of interest – hits home. The gallery where this work is displayed has a window overlooking Manette Street, and the immensity of Cennetoglu’s task is mirrored right across this tiny alleyway, where London’s great cavern of books, Foyles bookshop, is located. Founded in 1903, Foyles currently stocks more than 200,000 different titles displayed over 6.5km of shelving. Downstairs from Cennetoglu’s show, Henderson’s exhibition Charmer Scripture has an entirely different feel. Henderson is a young artist from Canada, who splits her time between Vancouver and New York. Her installation brings together sculpture, 16mm film, and textured paintings. 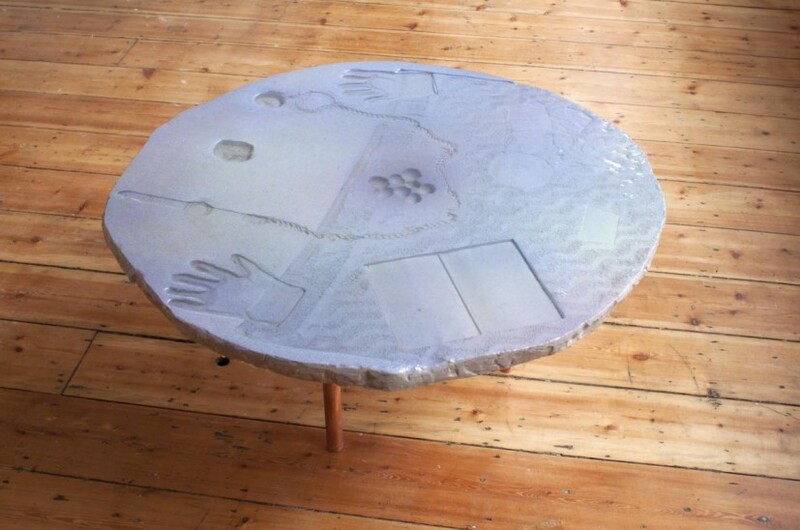 Henderson’s overall aesthetic is colourful, watery and very hand-made. She has hung a light blue and ochre curtain over one of the windows overlooking Manette Street, giving the space an improvised domestic atmosphere, and providing a comfortable environment in which to enjoy the dreamy state of mind her work brings on. 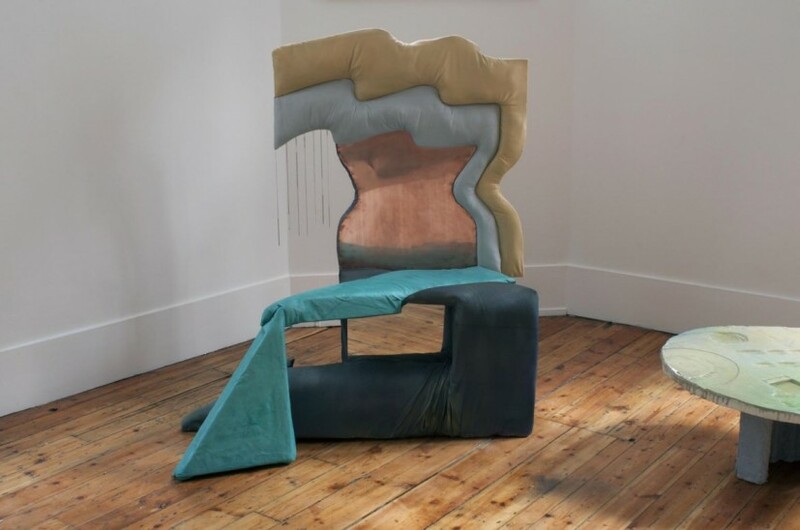 The sandy texture of her paintings and the liquid appearance of her sculpture – many of which also function as furniture – give one a sense of being by the seaside. In preparing this show, Henderson went through a course of past life regression; a technique that uses hypnosis to access and recover memories of past lives. She then used the information she gathered during these regressions to make new works, which somehow manage to evoke a sense of being from another – perhaps even an ancient – era. It’s a compelling idea, which loops back into the imagined, and lived, past of Charing Cross Road. Caroline Douglas is away and will return next week.